1. Rinse the lettuces under cold running water. Remove the leaves, separating the outer leaves from the inner leaves. 2. On a preheated barbecue, place the outer leaves to char on all sides then remove. Cut the lemons in half and place cut-side down on the barbecue until charred marks are visible. 3. To serve, season the prawn cocktail with salt, freshly ground black pepper and a generous squeeze of the charred lemon juice. Cut the charred lettuce leaves into small strips. 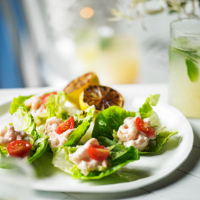 Place the charred leaves on the reserved inner lettuce leaves, spoon some of the prawn cocktail on top and finish with quartered tomatoes. Squeeze a little more of the charred lemon juice on top.